FAG Open Deep Groove Ball Bearings. 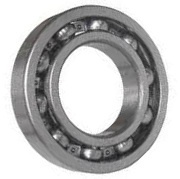 Most commonly used bearings, the open types are manufactured without seals to allow for the free circulation of either oil or grease, these bearings are commonly used in gearboxes and other environments where no foreign matter would be present and a lubricant supply is available.Used widely in transmissions. Can be lubricated with oil or grease.